As parents proudly share photos of their children going back to school, one mother’s came with a heartbreaking message. Julie Apicella shared two back to school photos that capture the heartbreaking reality of childhood cancer. 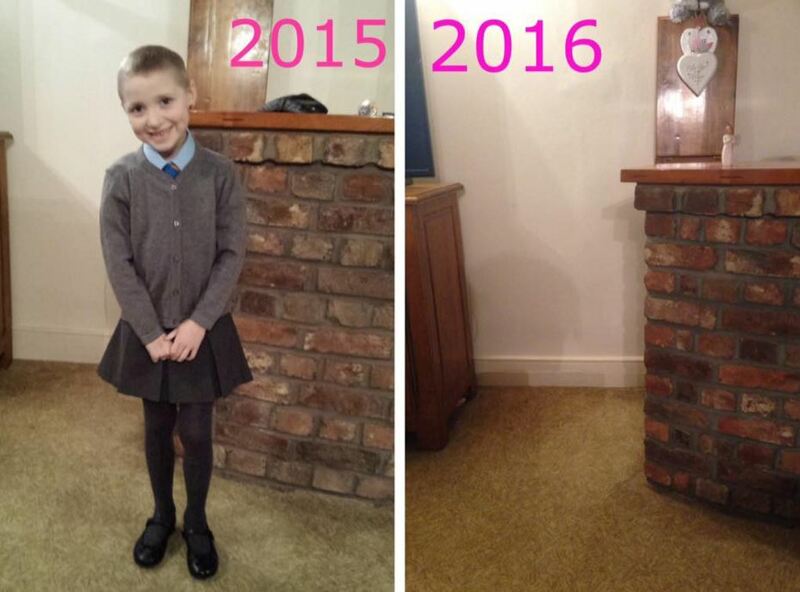 Taking to Facebook, she posted a photo of her little girl in her uniform in 2015, and another from 2016 showing an empty space. Her daughter, Emily, was diagnosed with a type of kidney cancer known as Wilms’ tumour when she was five years old, The Huffington Post reports. About 70 children in the UK develop a Wilms’ tumour each year. School photo time – obviously someone very special missing – my daughter Emily. Imagine if your school photo this year is the last you will ever be able to take and will just be a memory to remember. Within a week of being posted, Apicella’s post has been shared more than 8,500 times. Nearly everyone on my list has children or family members and this could be your reality in the future. One in 285 children will get a cancer diagnoses. Raising awareness of symptoms and that childhood cancer is not rare is the first hurdle to jump. Eventually the gold ribbon of childhood cancer will be as well known as the pink ribbon for breast cancer but it takes people to actually post on social media ect for this to happen. If you want to support the Go Gold Project for childhood cancer, click here.